Some people like to keep birds in cages. Kent Phillips, a Master Gardener in Howard County, likes to keep birds out of his cage. 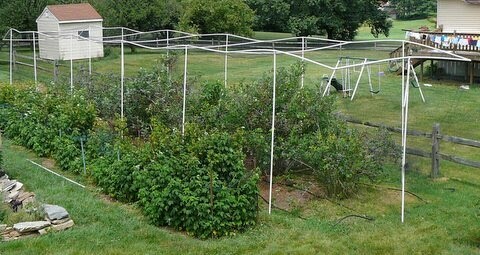 Each June, Kent and two helpers assemble a 10’ high by 10’ wide by 60’ long cage around his blueberry patch so the Phillips family, not neighborhood birds, will feast on the 16 to 20 gallons of fruit that his nine high bush blueberry bushes produce from early June into early August. The uprights of the cage consist of 10-foot lengths of ¾-inch PVC pipe. Each upright is strengthened by a 10’ piece of rebar. Cross-supports at the top link everything together with a system of PVC T’s and L’s. Some are glued permanently, while others aren’t, to facilitate assembling the cage in spring and taking it down in the fall. He pounds a 3-foot piece of one-inch iron pipe into the ground to make 12” to 18” holes into which he slips the PVC/rebar uprights. He then wraps the huge, rectangular PVC box in plastic bird netting. Kent listed three important factors to keep in mind when raising blueberries—pH of the soil, water, and the every-hungry birds. “The cage takes care of the birds, of course” he said. “My drip irrigation system takes about 3 hours a week to put down an inch of water, without which the berries would be stunted and production would fall. The Home and Garden Information Center has outlined a program using ferrous sulfate and elemental sulfur to keep the pH of the soil between 4.5 and 5.5, the range for maximum fruiting. What does his family do with up to 20 gallons of blueberries? “I’m sure,” I replied, salivating at the thought. How timely! I'm just considering how I might save our highbush fruit from the birds. Providing them with ample seed and suet doesn't seem to dissuade them. Anonymous: I'm with the birds, I guess. I noticed that when Kent was showing me his blueberry cage, I was sampling the blueberries. I never did make it over to his bird feeders. Wendy: Kent has a door into the cage wherever he wants one. He just slips the netting up one of the upright PVC pipes, steps inside, and lowers the netting. Anonymous: Kent will be happy to brainstorm with you by email if you have a question about his cage. i really like it. i recently installed bird netting in my garden. it is effective method to get rid of birds. Congratulations on finding a solution, Manfred. My brother has used netting over his 3 blueberry bushes for many years, but they've now reached a height that will require some kind of support. But it's worth it. 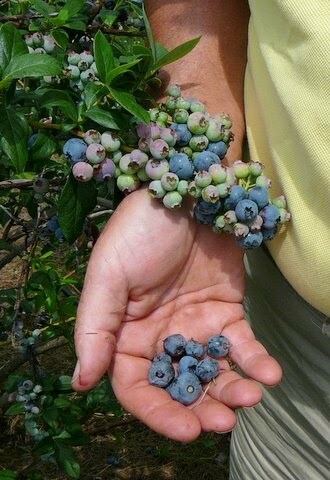 There's nothing like a handful of fresh-picked blueberries–right off the plants in your garden. 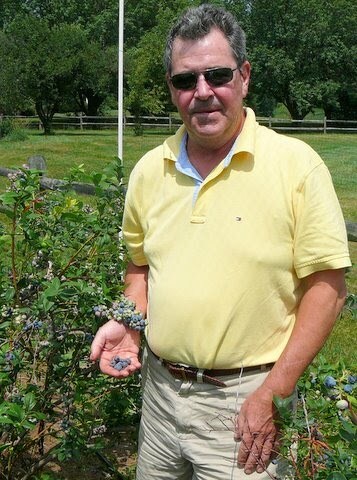 I did not believe Kent produced Blueberries, where can you purchase the plants? I saw them being sold in Canterbury this morning as local produce. Amazing. Is the Canterbury where you bought blueberries in Kent, UK? Our Kent is a person, who lives in Maryland, USA.